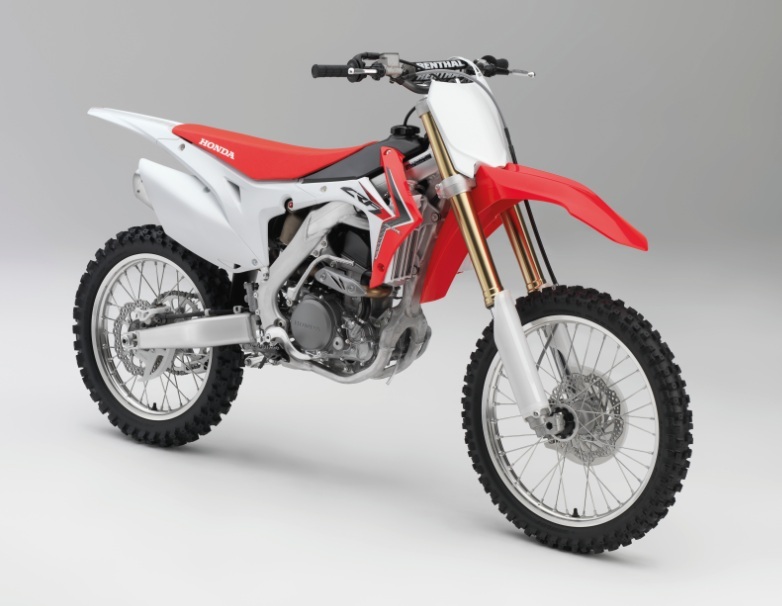 Ok, here is some information from Honda on their 2014 CRF250R. Just please remember to decipher through the marketing propaganda. The 2013 Honda CRF250R was a careful evolution of the previous model, a machine that won both U.S. Supercross Lites titles in 2012. Fighting in a finely balanced arena of competition the CRF250R has consistently proven itself a complete and winning package – its combination of power, poise and pin-sharp agility devastatingly fast. For 2014 HRC’s development engineers have chosen revolution over evolution, and upgraded the CRF250R with the same mass-centralised aluminium beam frame and design philosophy as the awesome open-class CRF450R. The engine and PGM-FI fuel injection likewise have received updates to further improve power, torque and throttle control, while weight has been trimmed wherever possible. At the heart of the 2014 CRF250R’s transformation is the aluminium beam frame that debuted on the CRF450R for the 2013 model year. The low centre of gravity and reduced turning inertia the new chassis brings help improve the already stunning handling abilities of the CRF250R over ground and – perhaps even more importantly – in the air. Internal improvements to the 48mm Showa inverted front fork are complemented by a compact new Showa rear shock, revised Pro-Link suspension and redesigned aluminium swingarm. Always a jewel of usability, delivering incredible drive from anywhere in its wide rev-range, the 249cc engine has received a multitude of upgrades from HRC’s development engineers including major work on the PGM-FI fuel injection, gas flow through the head as well as intake and exhaust efficiency. The new CRF250R has been honed to an even higher state of perfection and, once again, HRC has created a motorcycle in a state of the purest balance. The ultimate riding tool for the professional and amateur alike. HRC started out with a number of requirements for their sixth generation of MX aluminium beam frame: improved front and rear traction – plus the feel for available grip, so important to a rider – high-speed stability and braking plus a much lighter sensation when turning in all situations and conditions. In every respect the CRF250R’s new frame is a game changer in its class. It’s a complete redesign. Weighing in at just 9.35kg, the junction of the steering head and main frame spars now intersect much lower on the steering head pipe, closer to the midway point rather than toward the top. This change helps lower the centre of gravity and instills more ‘tuned’ flex into the chassis for better front-end traction and improved corner speed. The steering geometry of 27.23°, with 116.7mm trail and wheelbase of 1,489mm takes advantage of the frame’s enhanced performance parameters and gives a more direct connection to the front tyre, with increased feel for available traction and faster turn-in. Combined with the lower centre of gravity side-to-side transition is easier, greatly increasing rider confidence and reducing fatigue. All-up kerb weight is set at 106.2kg. A CRF250R-exclusive lower cradle houses the engine. Careful packaging of equipment around the frame contributes to mass centralization, the subsequent decrease in inertia and lighter overall feel of the CRF250R. The electrical components – ECU, condenser, regulator and wiring harness – save weight and are centrally located below the throttle body. Revised, lighter weight radiators – specific to the CRF250R – are mounted lower. The top mount of the Showa rear shock is sited 14.5mm lower within the frame and the shock itself is physically 14.5mm smaller, and features revised a spring weight plus new rebound and compression damping rates. The benefit of mass centralization in this area is reduced pitching inertia along the bike’s centre line; harder braking is possible with improved stability. The new aluminum swingarm provides added rigidity thanks to taller beam height in the front and centre sections, minimising deflection and improving rear tyre traction on corner exit. The Showa 48mm inverted cartridge forks received new internal sub-piston diameter in the 2013 model year – from 35mm to 37mm – with improved low speed damping. For 2014 the spring weight has been updated to suit with the new frame. Rebound and compression damping remain adjustable through 16 positions. The Pro-Link rear suspension features new CRF250R-specific linkage ratios and allows 12.3in of wheel travel. Fully adjustable, the rear shock features 17-position rebound adjustment; compression damping is separated into 13-position (low-speed) and 3.5 turns (high speed). The CRF250R’s new bodywork inherits an evolution of the ‘triangle proportion’ dynamic seen on the 2013 CRF450R; the motorcycle is singularly built about the rider’s needs, with mass centralization and superior ergonomics key. The radiator shrouds, side covers, lightweight seat and fuel tank offer a slim, smooth and continuous transition allowing the rider huge freedom and flexibility of movement. Fuel capacity is 6.3 litres. Also, the bodywork attachment points where the rider contacts the bike are extremely rigid so the rider can grip the bike hard for better feel and control. In addition, the rear fender has a lift point with integrated support to make it easier to hoist the bike onto a stand. Lightweight 80/100-21 front and 100/90-19 rear tyres save unsprung weight. Protecting the front 240mm wave pattern disc and two-piston brake caliper is a two-piece cover; the rear 240mm wave-pattern disc and single-piston caliper is also shielded. During this cycle of development HRC’s race engineers focused attention on a number of areas to further improve the CRF250R engine’s output and delivery. The 249cc, liquid-cooled four-valve Unicam unit has always impressed with its broad spread of useable power no matter the revs, plus a crisp and instant throttle response. Building on this all-round drivability and searing top-end were the targets. Combustion efficiency, thanks to a higher compression piston (compression ratio is increased from 13.2:1 to 13.5:1) and re-shaped cylinder head and inlet/exhaust porting, is improved. Bore and stroke remains 76.8mm x 53.8mm; the 30.5mm diameter titanium inlet valves and 25mm dia. steel exhaust valves are also unchanged. The 5-speed gearbox has been revised to improve durability. Power and torque improvements have been focused on the all-important low-to-mid range. Like the 2014 CRF450R the smaller capacity sibling gains new PGM-FI mapping with Dual Injector timing and employs a revised injector angle. A CRF450R specification airbox is married to a dedicated CRF250R air boot and twin rear mufflers – centralising mass once again – are exclusive to the CRF250R.